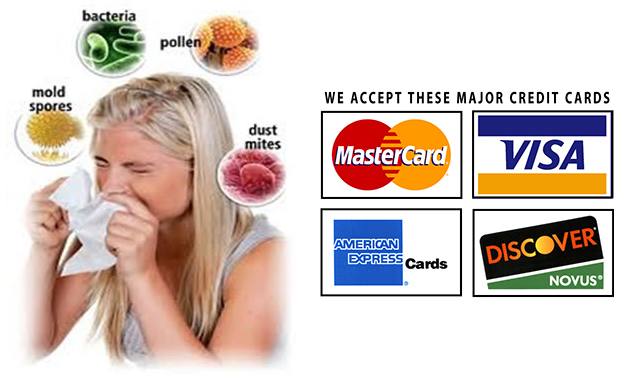 Don't let your air ducts make you sick.There is no "fresh air" coming from your central air conditioning system. You are constantly breathing recycled contaminated air. We attach a powerful triple filtered HEPA vacuum system to one of the vents that normally blow out. We then create negative air at the other vents by blocking the intake, usually at the filter. With the system turned off, all of the air ducts that blow out will then draw in air, making it safe to clean the vents while dust and debris is being drawn into the tripled filtered HEPA vacuum. The fogger is placed in the air conditioner’s intake with the system’s fan running to sanitize the entire system and to inhibit the future microbiological growth by utilizing a natural disinfectant that is harmless to occupants. Air duct intakes are cleaned by utilizing a HEPA filtered commercial grade backpack vacuum. The air duct intake grills are usually covered with dust, and don’t contain as much microbiological growth as the outlet vents.